I haven't had an evening of bar hopping and walking the city streets in a long time. There's something to be said for aimlessly wandering around, exploring, laughing, drinking, getting late night eats and rolling into your apartment at sunrise. 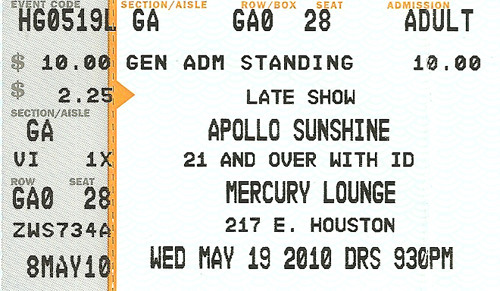 Last night I met up with Hugo at Mercury Lounge to check out Apollo Sunshine. (He even bought a paper ticket from someone outside so I could have one, since he knows I'm weird and love that kinda stuff!) Their sound was kind of all over the board... no two songs really sounded similar. They did play a few songs that I really liked. Check out Singing to the Earth, Breeze, and Magnolia. After the show we stopped by Rockwood Music Hall and listened to Julian Velard play for a bit. I really like his music! I ended up downloading a bunch of his songs today. It was just him and a piano, which was great. I almost wish the songs I downloaded of his on iTunes were more raw, stripped down tracks. He's playing at Rockwood again on June 18 and 19- definitely check him out. When Chris finished his set and Kenny's was closing down, we walked over to Veselka for some food. I got blueberry pancakes and Hugo ordered pierogies with mushrooms and sauerkraut. (Here's where I raise a skeptical eyebrow at his plate and point at the three cups of condiments asking what the hell he had going on. The cups were applesauce, onions, and sour cream.) I can't tell you people enough times how bad I am about trying new things... but really, this was not something on my must-try list. He got me with "when was the last time you had sauerkraut?" To which my answer was obviously "never", so he convinced me to try a bite- with everything on it. And as much as I winced while chewing ("that's your 'like' face?! I don't want to see your 'dislike' face!") I did really like it. Honest. I must be more open minded about food and more willing to try stuff. By the time we paid it was nearly 4am, and we walked up to Union Square to get a train back to Queens. I got home after 5am, with the sky brightening up and the birds already singing. I crashed out for an hour and a half before getting up for work. (o_O) Really fun night, though! I'm always happy to check out new places around the city and love getting turned onto new music. Work wasn't all that bad today, thankfully, and I leave at 4:30a tomorrow for a long weekend in Florida. Life. Is. Good.